Dennis Hopper was born on the 17th May 1936 in Dodge City, Kansas USA, and was an actor, director, poet, painter and photographer, still known for his roles alongside James Dean in the films “Rebel Without a Cause” (1955) as well as “Giant” (1956). Dennis was the director of and actor in “Easy Rider” (1969), the cultural symbol of the hippie America, which received the First Film Award at the Cannes Film Festival and became a cult film. Hopper is also known for his roles in “Apocalypse Now” (1979), “Blue Velvet” (1986) and many other films. Dennis Hopper had been active in the entertainment industry from 1954 to 2010, before passing away on 29th May 2010 in Los Angeles, USA. How rich was the actor? Authoritative sources estimate that the overall size of Hopper’s net worth was as much as $40 million at the time of his death. To begin with, Dennis Hopper grew up on a farm near Dodge City before moving to San Diego, where the actress Dorothy McGuire encouraged him to seek his fortune in the movie business. Concerning his professional career, Dennis Hopper appeared in over 150 films, but was also recognized as a director, painter, poet, and a photographer whose exhibits were attended by thousands of visitors. It was in an episode of “Medic” in 1955, in which he played a young epileptic that his name appeared for the first time on the screens, alongside James Dean, to whom he professed great admiration. Moreover, together they starred in “Rebel Without A Cause” (1955) and “Giant” (1956); unfortunately, James Dean died in a car accident in 1955, which deeply affected the young Hopper, and he had several conflicts with the experienced director Henry Hathaway on set of the film “From Hell To Texas” (1958). Hopper’s behaviour banished him from Hollywood for several years. Then, Dennis appeared in television series’ including “The Twilight Zone” (1963), “Bonanza” (1964), “The Time Tunnel” (1966), “The Big Valley” (1967) and “Combat” (1967). Moreover, Hopper wrote and directed the film “The Last Movie” in 1971, but at that time his addiction to alcohol and drug took over. Still, he continued to star in the films “Mad Dog Morgan” (1976), “Tracks” (1977), “The American Friend” (1977), “Apocalypse Now” (1979), and others. In the early 1980s , when he was a chronic user of drugs and alcohol, he endangered himself in public by blowing up a circle of six sticks of dynamite attached to a chair and pointing outwards, next to where he was squatting; he emerged amid a cloud of dust, unharmed but very shaken and deafened for days. These controversies didn’t seem to effect his net worth. In the early 1980s, Hopper began a detoxification program, while still appearing in some films such as “Rumble Fish” (1983) and “The Osterman Weekend” (1983). He restarted his career thanks to his interpretation of the sadist Frank Booth in “Blue Velvet” (1986) directed by David Lynch. In 1988 he directed the film “Colours”, much appreciated by critics. He continued to be an important person in Hollywood, as the actor, photographer and as a filmmaker, including landing two villain roles in the movies “Speed” (1994) opposite Keanu Reeves and Sandra Bullock, and facing Kevin Costner in “Waterworld” (1995). 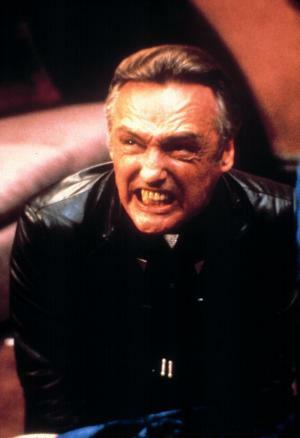 In 2010, “Alpha and Omega” was the last film which was voiced by Dennis Hopper. Finally, in the personal life of the actor and director, he married five times and four children, to Brooke Hayward (1961-1969) one daughter, Michelle Phillips (1970-1970), Daria Halprin (1972-1976) one daughter, Katherine LaNasa (1989-1992) a son, and Victoria Duffy(1996 -2010) a daughter. Dennis Hopper died at his home in Venice, Los Angeles on the 29th May 2010, at the age of 74 years.